This gingerbread house, like our other 3D house ornaments is a perfect little house shape, however being much smaller than our house ornaments it is quick to make and can be turned into so many things, such as a necklace, bookmark, keychain etc Made using Round Peyote and Odd Count Peyote the house takes around 2 hours to bead, making this pattern ideal for making little Christmas gifts. As usual with ThreadABead featured patterns we give full detailed photographic instructions and in this pattern there are 55 detailed steps, making this pattern even suitable for beginners to beading. Please note the pattern may not work with any other size and type of beads. 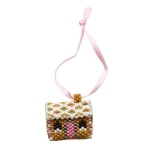 There are 9 colours in total and the finished beadwork is approximately 1.75 x 2 x 2.5cm. Wadding is optional and a no tangle thread bobbin is useful. If the beadwork is to be used as an ornament or keychain some ribbon/thead or a keyring finding will be needed to hang the beadwork from. The bead pattern supplied is 20 pages and includes a colour chart of suggested delicas, a colour pattern and a numbered coloured pattern.